i cant understand why the government is wasting the money by opening new branches of JAS.Because it is only doing revenue losses for government and also spoiling the life of the pharmacist on the store on minimum wages. Time and again govt. is proving its inefficiency in managing basic duty.The Govt. doctor says that the generic drugs do not work many times. If this is so the doctor should have reported the matter to the drug control department and the department in turn should have probed this and if any substandard result obtained , immediate corrective steps should have taken. Instead allowing the govt. 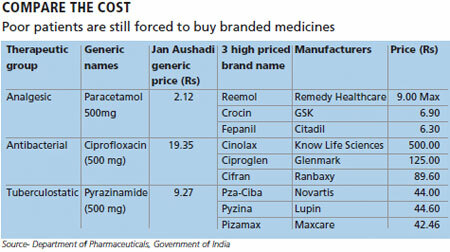 doctors to opt for the branded costlier drugs amounts to fooling oneself, one side govt opens JAS, and other side Govt. doctors refuse to prescribe the generic drugs. Both the govt. and doctors should have been taken for task.